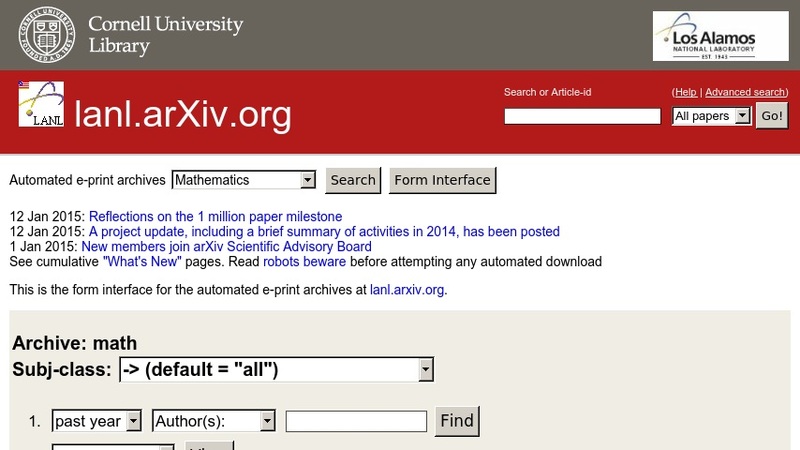 ArXiv is an e-print service owned, operated and funded by Cornell University, and partially funded by the National Science Foundation. The database includes articles online in the fields of physics, mathematics, nonlinear science, computer science, and quantitative biology. From the Mathematics section, visitors can search for related articles on topics by using an online search form with various search options. For example, articles can be retrieved by searching on recently posted abstracts within a particular topic or by author using the "form interface" or by words in the author, title or abstract fields using the link for the search function at the top of the webpage. The publications are each available in a variety of formats.